Freedom Rockz: Free Assie-tizer! Outback Bowl Everyone Wins! Free Assie-tizer! Outback Bowl Everyone Wins! Watch the Outback Bowl on Jan 1st, 2013 on ESPN 1PM ET. Find out who wins. 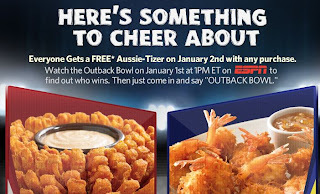 Everyone gets a free Assi-tizer Just come in & say, "Outback Bowl" Jan 2nd 2013 with any purchase.I love Outback yummo!